Pai lip balm softens and protects dry, chapped lips and is perfect for sensitive lips as it contains absolutely no chemicals. 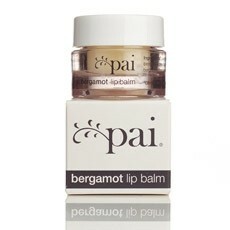 Pai 100% organic bergamot-infused balm is the essential handbag accompaniment. Made from beeswax and sweet almond oil it acts as a barrier while softening and moisturising dry, chapped lips. Uplifting and aromatic Bergamot essential oil is cold pressed from the peel of the Sicilian bergamot orange. Sweet almond oil*, beeswax*, cocoa butter*, bergamot essential oil* (bergapten free). *Certified Organic (100% of product).